How do you know if your campaign is really working? It’s the age-old question of advertising, and it was the question that digital was supposed to solve. Determining whether your ad drove conversions was supposed to be as simple as checking the number of clicks on your ad. Alas, while click-based metrics have made for a big step forward from offline marketing, for many campaigns, tracking clicks isn’t enough. Rather than thinking of click-throughs as the beginning and end of ROI measurements, marketers could benefit from thinking of campaign metrics like a target—a series of circles that, looked at as a whole, make it possible to see the full picture . 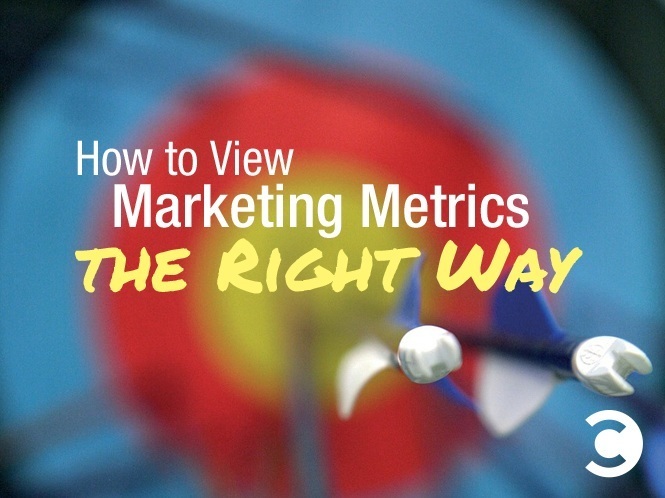 Click-based metrics are the bullseye at the center of the target. Content marketers like click-throughs both because they’re easy to measure and reliable. If you’re just starting out with your digital campaign, clicks are certainly a reasonable place to begin. For many marketers, getting started with click metrics means using a marketing automation platform that tracks the various click-based customer touchpoints: visits, clicks on an email, SEM, organic traffic, forms filled in, etc. When a potential prospect successfully “converts” (become a client), it’s quite easy to look at all the customer touchpoints that drove the conversion. To keep things as simple as possible, a lot of marketing automation platforms will give equal weight to each touchpoint. For example, a boutique clothing retailer that sold $120 worth of goods to an individual might have identified three customer touchpoints: a shopping guide (downloads), Facebook (organic posts), and clicks on email. Those $120 would then be divided equally between each of those three touchpoints and each channel would be assessed accordingly. The vast majority of marketers stop right there. Unfortunately, because this approach ignores any other customer touchpoints that can’t be measured using clicks, it often can’t provide a true measure of a campaign’s success. It’s precisely because clicks can’t always provide the full story that we need to consider the next circle of our target: view-through metrics. With view-through, you’re measuring the number of users who have been exposed to an ad who later convert—as opposed to merely the number who have clicked on the ad. The technology is made possible by cookies, and there’s usually a 30-day window that’s tracked. In other words, if a user is exposed to an ad but does not convert within the next 30 days, the conversion would not be credited to the ad. While view-through began as a display advertising technique, view-through tracking is also increasingly available for native advertising/sponsored stories. Take the case, mentioned above, of the boutique retailer with a shopping guide that’s available for download. Let’s say the retailer is also running a sponsored post (perhaps an excerpt from the shopping guide on Mrporter.com) which leads to the download page. With click-through, you only know whether the user makes that last click on the download button. With view-through, you’re also able to track whether the user was exposed to the sponsored post at some point earlier in the process. View-through metrics are somewhat controversial because it can be difficult to gauge how instrumental any one ad is in driving purchase behavior. For this reason, marketers give a 0% to 100% credit. One could argue that email marketing should also be measured using view-through metrics (open rate), because the majority of your consumers may open the email but not click on it. What happens when you have consumer touchpoints that aren’t click-based and don’t provide any view-trough metrics? Welcome to the third circle of the target. Unfortunately, this is where a good chunk of your content marketing activities need to be generated. Most editorial articles produced for a third-party (in a non-paid capacity) won’t have a link to your website or offer the ability to drop a pixel on the site. Nor is it possible to track media coverage at the individual (i.e., cookie) level. Offline activities, such as sending your beautiful print magazine by mail, are a tough one as well. And, of course, there are plenty of challenges when it comes to tracking a campaign in the mostly cookie-less world of mobile. Still, if not every activity is as measurable as we’d like, it doesn’t mean your campaign isn’t working—some offline ads perform amazingly well despite the impossibility of registering touchpoints. One good way to work around the measurement problem is to use email addresses as identifiers. For example, in my current company, we tag each recipient of our print magazine in our marketing automation platform so that the magazine becomes another touchpoint. So, there you have it: a target-based outlook on targeted marketing. Click-throughs might be the bullseye, but they’re not the whole story. If you want to really know the ROI of your campaign, you’ve got to consider the full target.